When you live in the most beautiful city in the world, why leave? It’s easy to have a staycation in Vancouver, the hard thing is choosing from the amazing options on our doorstep. One of my top staycation destinations would be Squamish, BC but more specifically the Sea to Sky Gondola in Squamish, BC. While not technically in Vancouver, the one hour drive to Squamish to see the Sea to Sky Gondola is definitely worth the distance. Last year on July 1st, 2014 (to be exact), shortly after the grand opening in May, my boyfriend and I made the one hour drive from Vancouver to Squamish to see the Sea to Sky Gondola in all it's glory. The quick 10-minute gondola ride transports you 2700 feet (885 meters) above sea level, from the base station. It whisks you up to a mountaintop overlooking the waters of Howe Sound, as well as the Stawamus Chief, where views are incredible from literally every angle. The fun doesn't stop when you get to the top! Once at the summit you can venture across the Sky Pilot Suspension Bridge, a 325-foot (100-meter) span that sways above the valleys below. The bridge leads to the Spirit Trail Viewing Platform for more vistas of the mountains and the sound. The brand new Via Ferrata route was not constructed when I visited in 2014 but I am dying to try it. It is an engineered vertical adventure, assisted by metal rungs and a specialized cable system. Hiking up the mountain is probably the best thrill available at this attraction, and there are plenty of trails to discover. Mount Habrich Climbers Trail, Goat Ridge, Skypilot Mountaineer's Route and Copilot Mountaineer's Route are all back country trails that start and finish at the top of the gondola ride. Other less advanced trails around the summit are also great ways to taste the alpine experience and get the blood flowing. If you'd rather enjoy the views from a lounge chair, park yourself on the sunny deck on the Summit Lodge Restaurant and Edge Bar. The beverage of choice is the Sky Pilot Northwest Pale Ale, which the local Howe Sound Brewing Company is producing specifically for the gondola's restaurant. The cost is $37.95 for adults, $35.95 for seniors, $23.95 for youth, $13.95 for children age size to 12, and free for children under five. $95.95 for two adults and two child/youth tickets. You can save about $4 per ticket by purchasing online! The Sea to Sky Gondola is open year round, except for periods of seasonal maintenance. There are different activities offered and different hours of operation depending on the time of year. 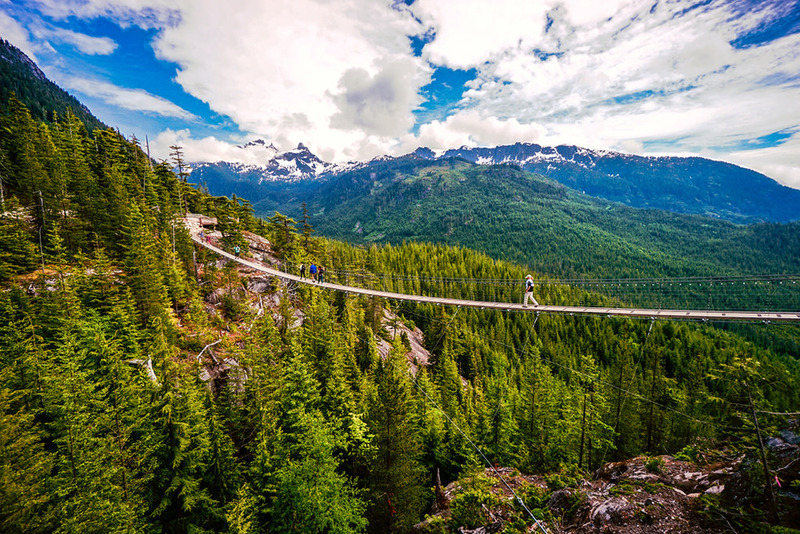 It came as little surprise to me when the New York Times' ranked Squamish #32 in their list of 52 places to go in 2015. Squamish was one of two Canadian places to make the cut along with Quebec City which ranked as #40 respectively.